Wooden Mallet - Wall Mount X-Ray Holders Is An Used Way To Hold Patient X-Rays. Wooden Mallet - Wall Mount X-Ray Holders are made of constructed with solid oak sides and color finished for long lasting durability. 20-1/2" W x 2-3/4" D pocket provides ample room for keeping x-rays or files secure. Predrilled and includes hardware for easy wall mounting. 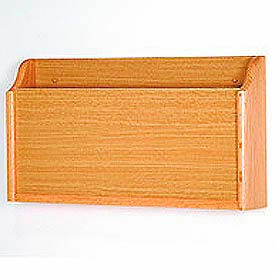 Size is 22-1/2" W x 3-3/4" D x 12" H. Color finishes are Light Oak, Mahogany and Medium Oak.